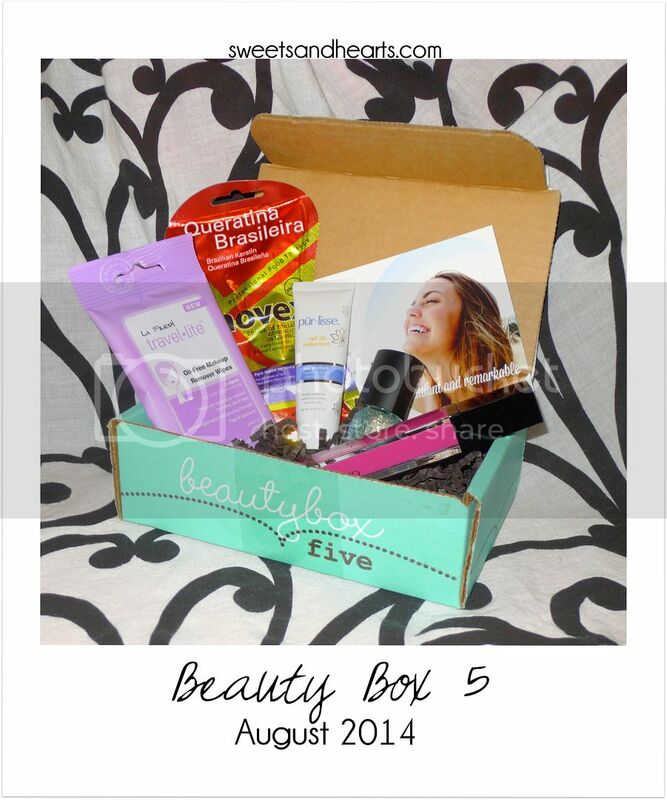 This month's box from Beauty Box 5 contained some products that are perfect for an end of summer pick-me-up! Nanacoco - Lip Gloss in "Lovely"
Novex - Brazilian Keratin Deep Hair Care Cream - This deep conditioning treatment is made to revive and revitalize your dry and damaged hair (a must-need for summer!). After shampooing, apply it like your regular conditioner and leave it on for 15-25 minutes. I'm impatient and left it on for 10, but it still worked really well. 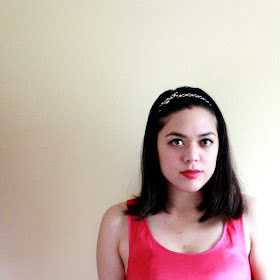 When I blow-dried my hair, I noticed it was smoother and looked a little straighter too. 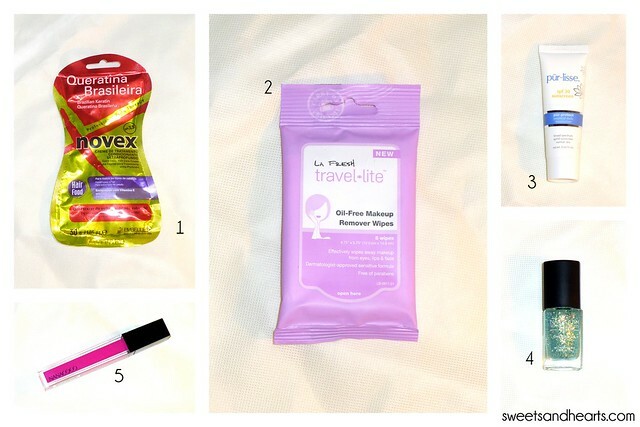 LA Fresh - Travel Lite Oil-Free Makeup Remover Wipes - I went to a wedding last weekend and these were extremely helpful when it came to taking my makeup at the end of the night. They removed my normally stubborn eyeliner and mascara, and even my lipstick! I liked the scent, and the formula is non-sticky and non-drying. It's designed for traveling and is the perfect size to bring along on short trips (and it's cheap too!). Check out my 'before' and 'after' photos below. Pur~Lisse - Pur~Protect Sunscreen SPF 30 - I'm a huge fan of Pur~Lisse products! They're a little on the pricey side, but they work really well on my combination/dry skin. This sunscreen is moisturizing without being greasy or heavy, and it absorbs fast too (perfect for applying under makeup when it's hot outside). Style Essentials - Nail Polish from "Touch of Teal" Collection - This nail polish is a very pretty iridescent hexagonal glitter. I used it as a topcoat over a pastel purple polish and the result was a subtle shimmer that added just the right amount of refined sparkle with just one coat. I can't wait to really pack on the layers next time--I feel like it'll be great for a glitter ombre. See below. Nanacoco - Lip Gloss in "Lovely" - I was a little nervous to try this lip gloss because the shade looked very bright in the container (I love saturated reds and corals, but pinks can be tricky on me), but not to worry because this added a sheer wash of pink that was surprisingly flattering and wearable. See below. 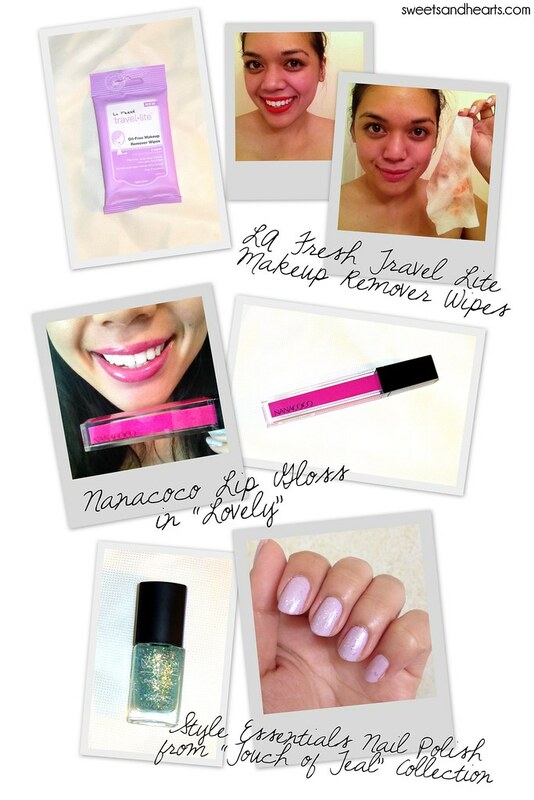 LA Fresh - Travel Lite Makeup Remover Wipes | Nanacoco - Lip Gloss in "Lovely"
Hope you enjoyed this month's Beauty Box 5 unboxing! You can discover new beauty faves and receive 5 surprise products a month too by joining Beauty Box 5 here.